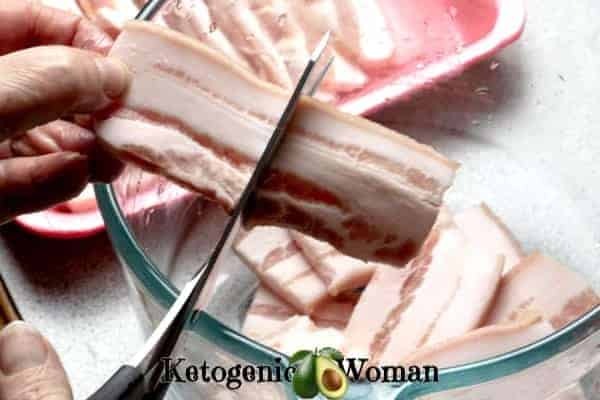 Have you ever seen those pork side slices in the supermarket and wondered what on earth to do with them? Well I have and one time I even bought a pack and cooked them just like I would cook bacon, because that’s what they looked like to me. Well that was kind of uninspired and nobody liked them. I’m about to rock your world and change all that! These crispy pork belly strips are quick, easy, crunchy and my new crack recipe! How do you make crispy pork belly strips? This recipe is about how to make the pork belly in the air fryer. But I will tell what you can do if you don’t have an air fryer. But you have to put one of these on your next Birthday or Christmas wish list! The air fryer is way more versatile than I ever imagined. The one I own is this awesome Ninja air fryer that holds 2 1/2 pounds of food. Yes, that is really it! Can I make crispy pork belly slices if I don’t have an air fryer? Yes, you can get them just as crispy in the oven. I like to cut mine into bite size pieces. The easiest way is to use scissors! We love the plain salt and pepper but you can certainly add some other spices such as a teaspoon of smoked paprika or cumin. Towards the end of your cooking time, it might get smoky in the kitchen. This will not harm your air fryer but do be sure to wipe down the ‘ceiling’ of the cooking area with a paper towel afterwards. Fast easy crispy crunchy pork belly crack! 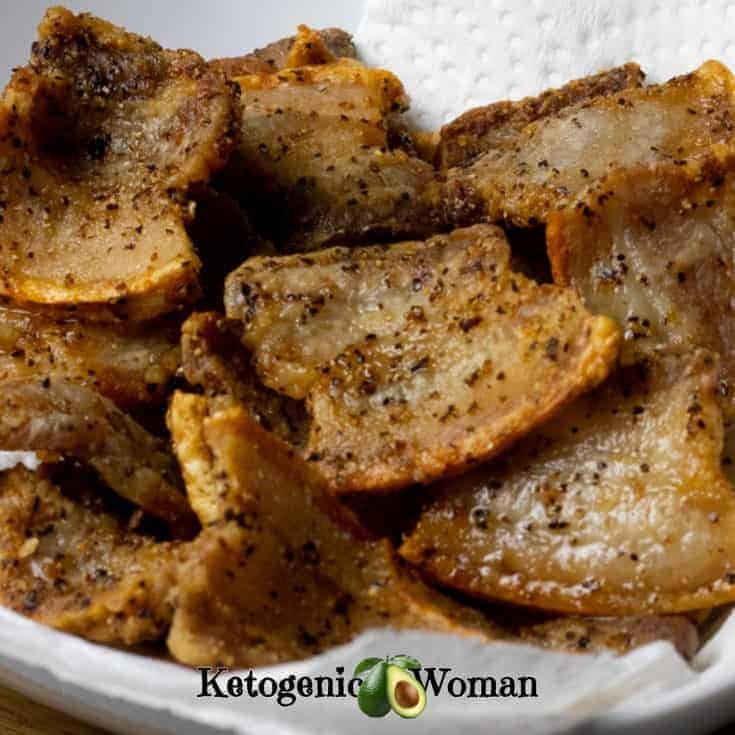 These pork belly slices cook up perfectly in the air fryer and make an addictive keto snack. Get your fix here! Crunch away and don't forget to share them! Pin this Air Fryer Pork Belly Crack recipe to Pinterest! 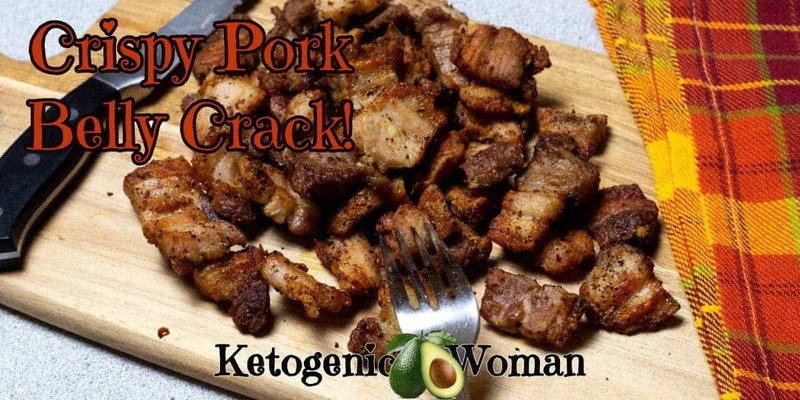 Tagged Air Fryer, Keto Pork Recipe. Bookmark the permalink.